Parrots are known for their colorful plumage. In popular culture, they are associated with pirates, as exemplified by Treasure Island's Long John Silver, whose parrot, Captain Flint, was constantly on his shoulder. They are best known, however, for their ability to precisely mimic sounds, including human speech. Many animals are able to communicate with humans, but only parrots (as well as a few other birds, such as mynas) are able to actually use human words. The ability to mimic human speech varies widely among parrot species and individuals. There is much debate about whether or not parrots actually use language, or whether they are merely mimicking human sounds without understanding their meaning. In either case, parrots are enormously intelligent and useful creatures. 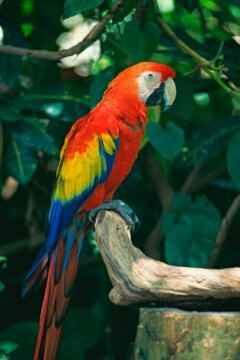 Parrots are intelligent and sensitive creatures that make excellent pets. People are attracted to the brightly colored plumage of many species, as well as their acrobatics and tricks, which are fascinating to watch. Training birds to do tricks, as well as to talk and to say certain phrases or make certain noises on cue is not overly difficult, and can be very fun. As pets, parrots can be wonderful companions, although they can also be loud and messy. They are not solitary creatures, and require that their owners spend time with them daily. In an article published in The "New York Times Magazine," (Creature Comforts, 12/31/2008) Rebecca Skloot profiled people who use unusual helper animals, including a parrot. Jim Eggers, of St. Louis, MO, is afflicted with bipolar disorder, and has psychotic tendencies. He uses his African Grey parrot, Sadie, to help him calm down and avoid the rages and psychotic episodes which have, in the past, resulted in injuries and troubles with the law. Sadie can sense when Mr. Eggers is beginning to get upset, and speaks to him to help him calm down. Since using Sadie he has only had one incident of psychotic behavior. Sadie also helps alert Mr. Eggers to household occurrences, such as a ringing doorbell, which he sometimes misses due to his medication. Parrots have been valuable research subjects for scientists studying animal intelligence, and the ability of animals to use language. Other animals, notably gorillas and chimpanzees, have been able to learn sign language, but parrots, with their vocal ability, are uniquely helpful in gauging the intelligence of animals. The most famous example of these is Alex, the African Grey parrot, who died in 2007. Dr. Irene Pepperberg, working with Alex, was able to teach him a number of important concepts and showed that he utilized these concepts, such as number and color, in ways that went beyond simple mimicry, to indicate actual thought. Youtube- Alex, the talking research African Grey parrot passes away.